Wish your best gal pals a Happy Galentine's Day this year with one of our handmade button badges. 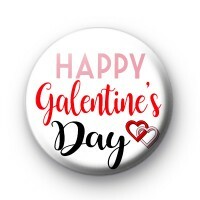 This white 25mm badge has the message Happy Galentine's Day written in pink, red and black font and hs two interlocking love hearts. Have you heard of this new craze of a Gal Pal style Valentine's Day. It is the perfect day to celebrate your oldest, dearest friends, those partners in crime. A day to share the love. We love the idea and think we all need to be supporting our sista's and showing them just how much their friendship means to us.